The oil market is on the right track and the market will quickly return to balance, said Saudi Minister of Energy, Industry, and Petroleum Resources Khalid Al-Falih. In his remarks during the Atlantic Council Global Energy Forum as part of Abu Dhabi Sustainability Week, Al-Falih said: "Demand growth remains healthy with forecasts in the 1.3 to 1.5 million barrels per day (MMBD) range, while supply is starting to reflect the impact of our adjustments (reached last month and are taking effect this month). "In fact, while the 1.2 MMBD cut came into effect only in January, secondary sources suggest that Opec production in December was already more than 600 (MBD) lower than November, the bulk of which is due to our own pre-emptive actions," he was quoted as saying by Wam news agency. Al-Falih noted that Saudi Arabia went beyond its commitment as it has lowered both production and exports, saying: "As the new 1.2 MMBD cut materialises, we should start to see the impact positively reflected in inventories, which is the key metric to watch. Looking at longer-term fundamentals, the healthy demand growth rate of the past several years is projected to continue into the future." 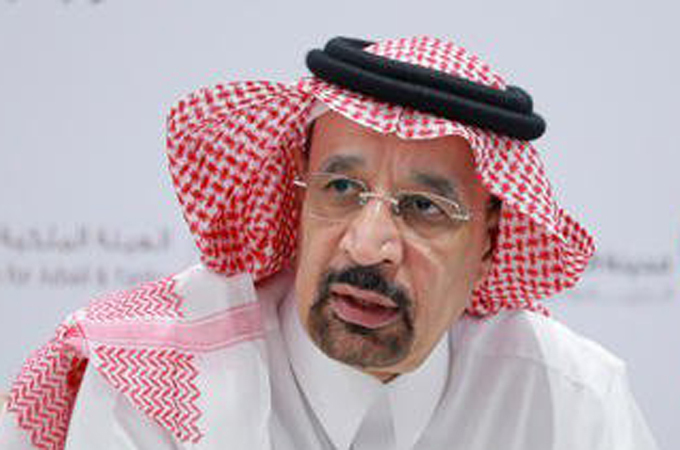 The Saudi Energy Minister said that the global economic growth and prosperity will be predicated on the presence of a healthy and vibrant oil industry, operating in an environment which attracts the necessary investments that will ensure an equal amount of affordable and accessible oil supply is made available in a reliable and timely manner. In this regard, he said that "Saudi Arabia is committed to representing a central part of that reliable supply, as it has always done." The Saudi delegation to the Abu Dhabi Sustainability Week includes a number of competent authorities in the fields of energy, industry and electricity to review future initiatives and projects to raise energy efficiency and develop new technologies to enhance sustainability in the kingdom. The kingdom is participating with an interactive pavilion, which includes 21 sectors, offering lectures and panel discussions on energy efficiency, reducing carbon emissions, Saudi Arabia's initiatives to localise electricity and related services, investment in the Kingdom, as well as the role of research and development for sustainability. The participation aims to shed light on Saudi Arabia’s role to achieve the goals of sustainable development and the measures taken to achieve them.